Amazon, amongst Google’s Android partners, strikes me as the greatest threat to direct competition with Google’s expanding efforts to become… Well… Amazon. Large portions of Android are open source. The top layer — the “Google” layers — belong to Google, but Amazon has the option to fork Android as well. Amazon is an online retailer and an infrastructure company. They’ve got a ton of brilliant engineers that understand software (AWS), as well as products (Kindle). One could argue that Google has more “product” people, but one could also argue that their product people don’t have that much of a lead on Amazon. I’m not saying this is a walk-on win for Amazon, but I see the next 10 years shaping up to make the old IBM vs MS vs Apple battle look like an undercard fight. 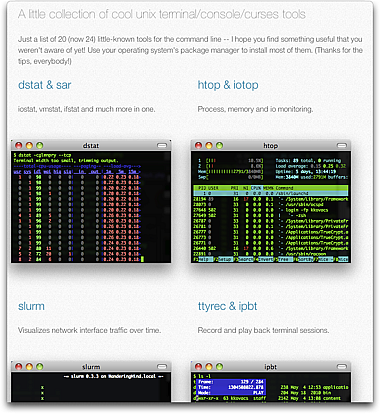 A nice little list of command line tools for a variety of tasks. I’m probably not going to be using the calendar any time soon, but I already use htop, iptraf, mtr, and siege (along with the obvious ones like xargs and vim).